When I lived in Paris, I fell in love. Not with a person, no, I love myself far too much for that nonsense, but with a pastry. 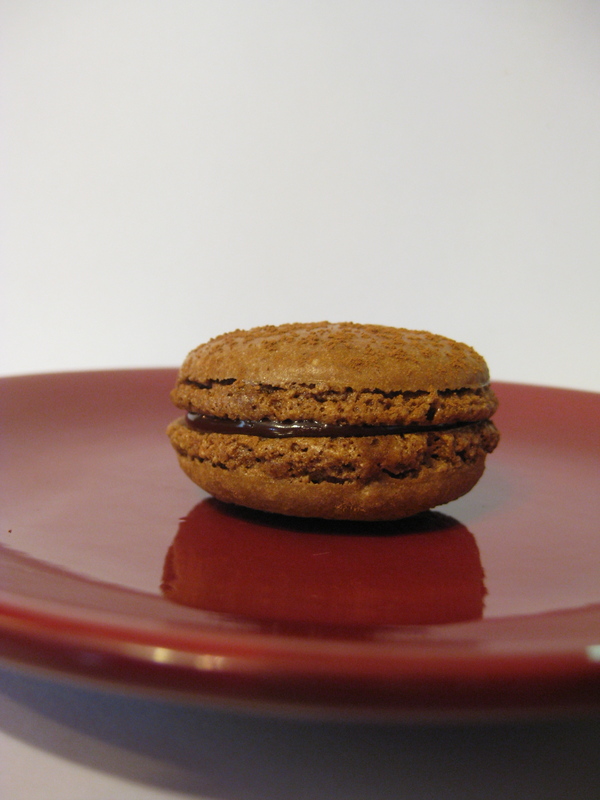 A macaron to be specific. I don’t know how many of these adorable delicacies I consumed, and I don’t care to think about how many pounds I added to my previously svelte figure with all of my new chocolaty friends. They come in all flavors from chocolate to raspberry to lemon to pistachio to vanilla to rose to orange, and they are all equally delicious. And, they are everywhere! Even the McDonalds in Paris sell macarons, and they are good! (Food is actually really good in French McDonalds. It doesn’t taste like a heart attack. I don’t know why, but it’s true.) 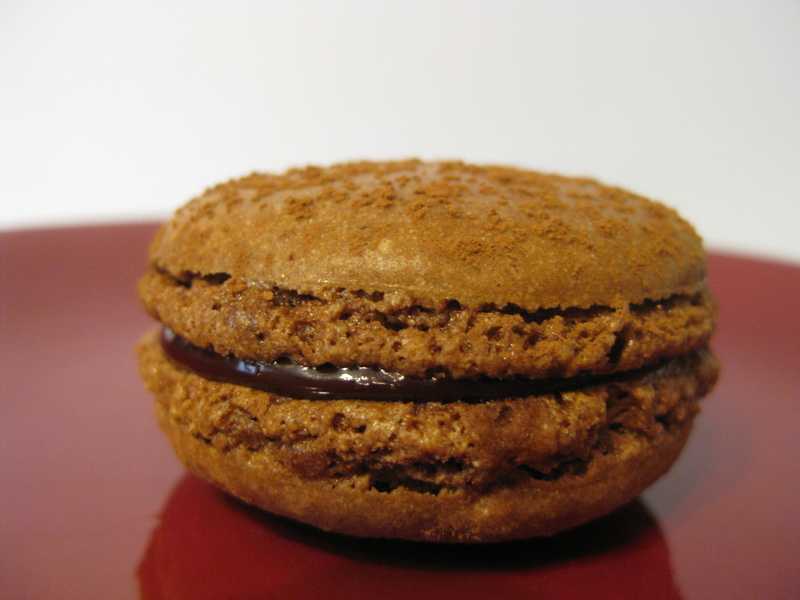 Though they on every corner in Paris, I don’t think anybody has even heard of a macaron in Iowa. They all think it is some kind of coconut cookie. I loved them too much not to bother, but I will admit that I was afraid. I talked to my friend Jongin a few weeks ago. She is still in Paris at Le Cordon Bleu and she talked about macarons. They finally made them at school, and she told me the same terrors. She said that you have to open the oven door every so often to let out the accumulated moisture or else failure was imminent. 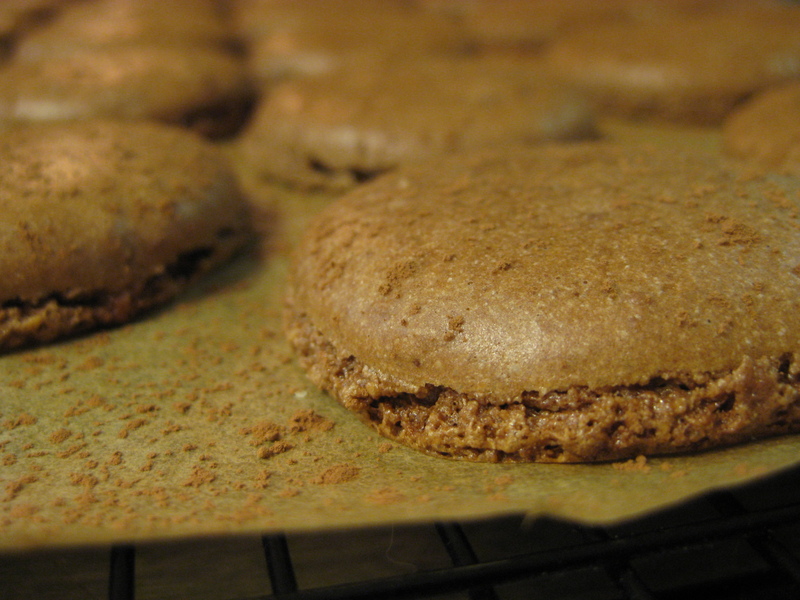 I prepared all of my ingredients, cocoa powder, powdered almonds, powdered sugar, egg whites, and granulated sugar. I looked at them all for awhile and then assured myself that I would never learn if I never tried, and if I didn’t fail, I’d have my favorite snack! The almonds looked a bit too large, so I threw them into the Magic Bullet and pulverized them. Lots of fun. I dumped my egg whites into a bowl and began to manually whisk them up to very stiff peaks, regretting each second that I hadn’t yet purchased this Kitchenaid that I had promised myself. My arms were killing me, but I am pretty sure I built up enough muscle to knock anybody out who criticizes my cooking. With trepidation, I lifted the bowl of egg whites above my heat and smiled when the whisk and eggs didn’t fall out onto my head. They stuck right inside the bowl. 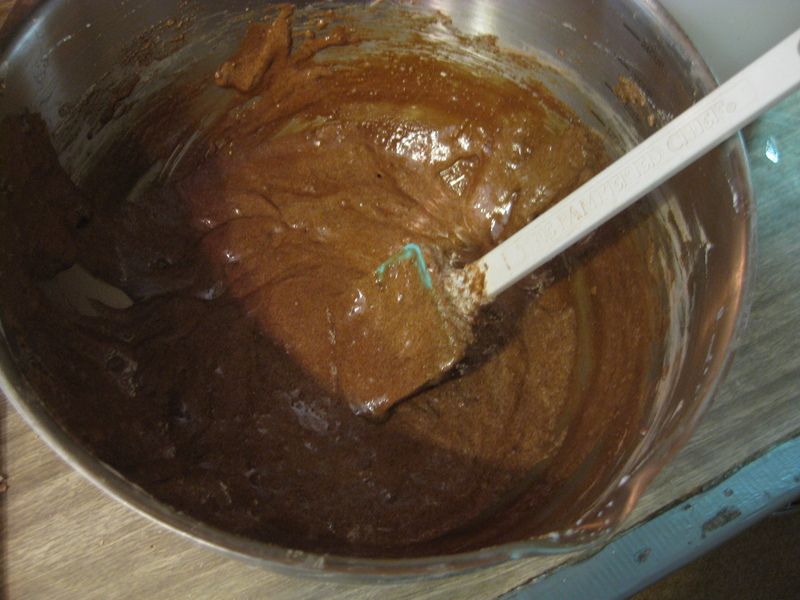 Then, I folded in my dry ingredients, and looked on with horror as the batter looked more and more lumpy. I folded exactly 40 times, and then no more. I ran into my first real annoyance here. In Paris, pastry bags are like, a foot and a half long. You can fit a ton of stuff in them, but here, they are nine inches maximum. It’s a royal pain, but I managed. 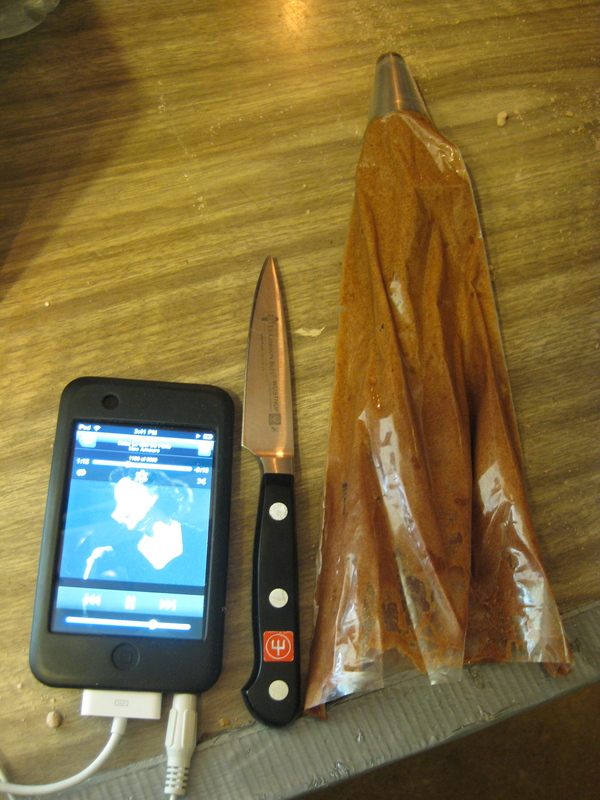 I filled up the pastry bag and began to pipe out little rounds. They weren’t perfect, some were excessively large, and some were too tiny. I felt sick when it looked like the macarons weren’t going to smooth out. They sat there with little points for a little bit, then collapsed, leaving the top shiny and flat. Perfect. I breathed a sigh of relief. First step, successful. I left them to develop a slight crust and then popped them into the oven. The chefs talked about moisture and different cooking temperatures. My oven is about twice my age and uneven, so I don’t think changing temperatures are going to help much, nor is opening the door to let out moisture. 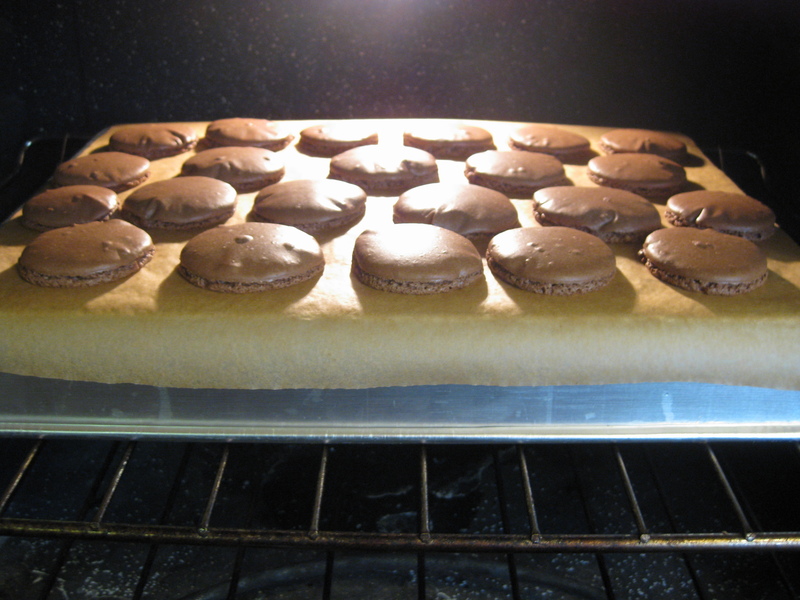 So, I just put the oven on a median temperature, said a little prayer, and put my first cookie sheet into the oven. Ten minutes later, I opened the door and peed myself. They were BEAUTIFUL. Wonderfully domed and with perfect little feet on each one. (The feet are the bubbly looking bottoms.) I shook one, but it wasn’t ready, so I waited a few minutes and then took them out. 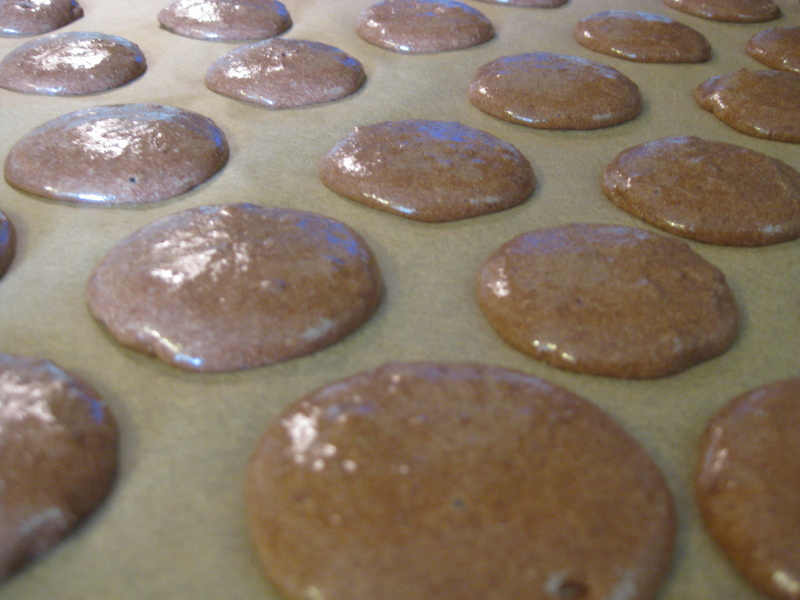 As they cooled, I shook some cocoa powder over them and removed them from their parchment paper as the others baked. 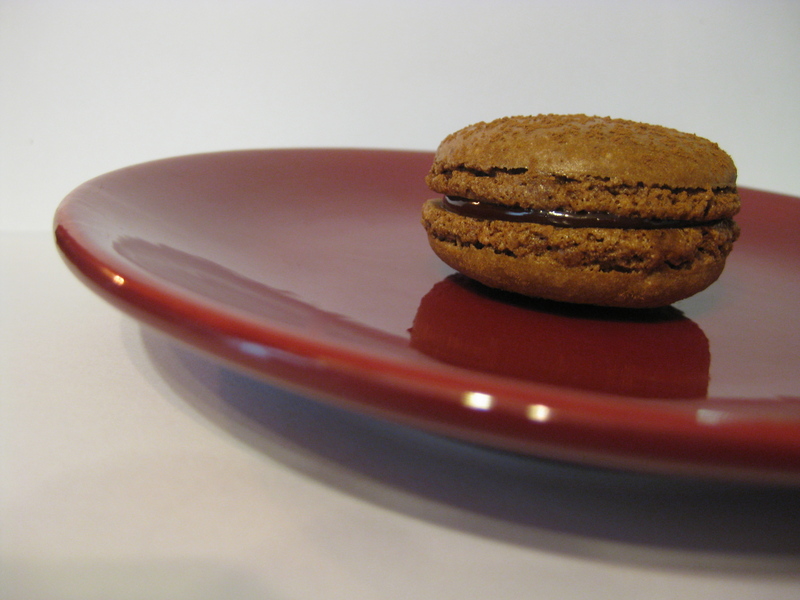 Amazingly, ever single macaron turned out. Only one broke as I removed it from the paper and only two or three burned. I was so happy and proud of myself. 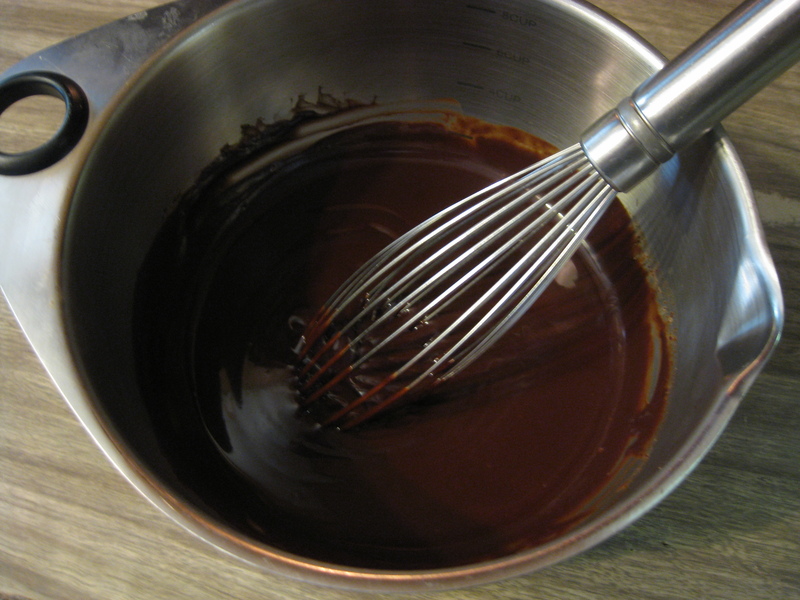 As they cooled down, I made the simple ganache and put it in a pastry bag. 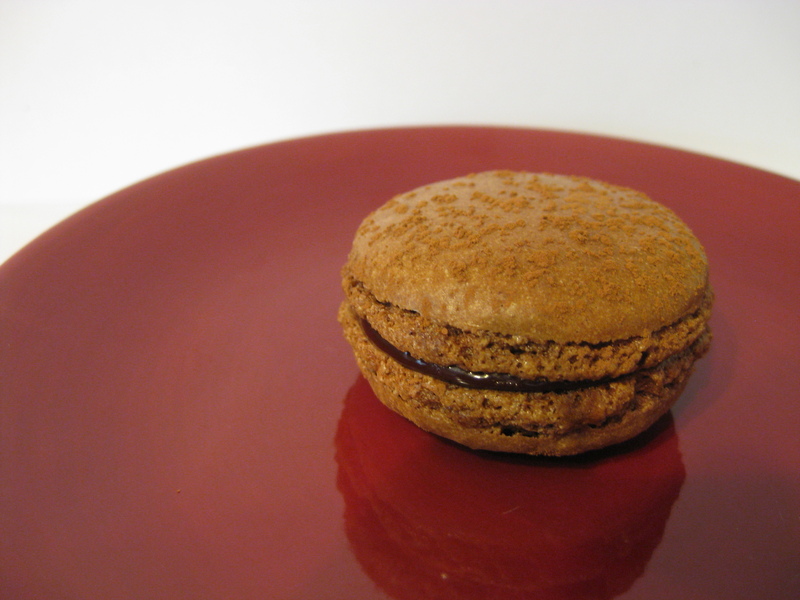 It was too runny to do any good, so I kind of poured it out of the piping tip onto the macaroon. Sandwiching on the top, I felt immensely satisfied. When all these were done, they were beautiful, so I had to take some pictures. My co-worker, Tracy, introduced me to the Bakerella website, which has some of the most beautiful food photography I have ever seen. 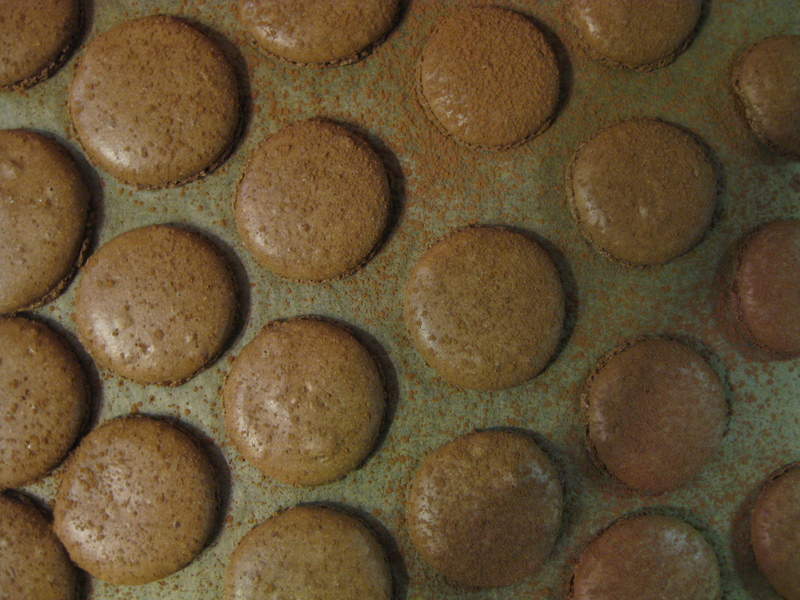 Inspired, I set up a little photoshoot for my macarons and the results were amazing. Maybe I should look into that food photography job my mother has connections to?